Has this ever happened to you? You’re sitting at home, having a nice evening on the couch with your pet and your TV, and BAM. You’re hungry. So you go to the fridge to satiate your rumbling tummy but, alas – no food. So you pick up the phone and make some calls about securing dinner, but wouldn’t you know it, you need money to pay it! Since you have no money, you need a job, right? And thus begins your adventure in climbing the corporate ladder to trade for sustenance. So begins this oddly light-hearted game of a not-so-average 9 to 5 – Peace, Death. Created by Russian indie developers AZAMATIKA, this newly released gem can be found on Steam with a release price of $4.34 USD (and it’s worth every penny). The story is centered around your average, every day reaper just trying to make a living in this crazy mixed-up world at Apocalypse, Inc. His four bosses, Pain, Pestilence, Famine, and Death, will ask him to work the front desk in purgatory, where he sends the souls of the dead to their appropriate places, either by a Stairway to Heaven or by Hellevator. Just kidding, they’re both elevators but we couldn’t pass up the opportunity for that joke (we’ve been waiting since childhood for that). As the days go by, the parameters for entrance to heaven become increasingly more restricted. For example, the exceedingly straightforward day one has a single rule – don’t let demons in heaven. Fast forward a few days and you can’t let in people holding a weapon, with blood on their chest and/or feet, and must take off hats of any soul wearing one to unveil any horns hiding underneath. Keep this up long enough and you just might earn enough money to buy some grub. The controls are really straightforward – one button for Heaven, one button for Hell. This game is more about reflexes – can you accurately send the right souls to the right afterlife at a fast pace? Hope so, because you’re graded (and paid) based on your accuracy. I couldn’t find any glitches, and the gameplay ran very smoothly. Since this is originally a Russian game, one would think that the localization might suffer, but no – the translations are smooth and intentionally hilarious (each soul says a one-liner upon entrance, and they’re often comedic gold). The animation is what drew me in – the pixelated souls of the dead are detailed and full of personality, and the environment is believable. Every inch of the screen is covered in hellish-goodness, and you can tell this was a labor of love by a dedicated team. The music – an obvious heavy metal – really sets the tone of the game and makes for an enjoyable experience. It wouldn’t make sense to do a write-up of Peace, Death! without pointing out the obvious similarities between it and Papers, Please. 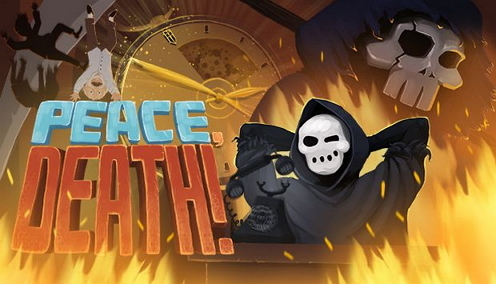 The two games are similar, yes, but strangely enough, Peace, Death! is the more light-hearted, less depressing one. Don’t get me wrong – I love Papers, Please and it’s worthy of all acclaim it receives, but I never walk away from a playthrough feeling good; in fact, I usually get into a dark mood because the plight of the citizens of Arstotzka is just so…desperate. Compare that with Peace, Death! where the demons bemoan the Winchesters (from Supernatural) for their deaths or sudden catastrophes usher in themed souls that may have died by overeating or some other humourous manner and…well, I don’t walk away feeling moody. Who knew that purgatory could be so…wacky? Peace, Death! is not a deep game. It’s press a button, A happens, press another button, B happens; lather, rinse, repeat. If you don’t like those types of games, this may not be your cup of Earl Grey; however, if you’re like me and you liked Papers, Please but want something a little bit different, you may want to pick up this title. It’s funny, it’s aesthetically pleasing, and it’s not much more than your morning Starbucks. Who knows – you might have a hell-raising good time!